Mt. Hood Organic Farms, in collaboration with Hiyu Wine Farm is now making a European-style, traditional method, Biodynamic cider under the label of Floréal. Our first cider was pressed in 2014 and included 12 varieties of heirloom and cider apples. Our 2015 and 2016 ciders included 16 varieties. The cider ferments naturally and ages for a year in barrels. It is bottled with fresh juice from the next year’s pressing to induce a secondary fermentation in the bottle. Nothing else is added to our cider—no sulfites, no sugar, no yeast. It is dry, complex and evokes the essence of the apples, our land and its relationship to Mt. Hood. The glacial river that flows through the farm gives it a particular minerality. We continue to transform our orchard and to graft and make our own trees—17,000 in the last three years—and now have 57 cider specific apples and crab apples, with a total of over 77 varieties of apples and 16 pears, including 6 varieties of perry pears on 60 acres of orchard and 200 acres of land, all USDA Certified Organic and Demeter Certified Biodynamic. Our cider will change as our young trees mature and the blend includes an ever greater diversity of the American, French and English sharps, bitter sharps and bittersweets, as well as quince and crab apples. A true perry is on the horizon. 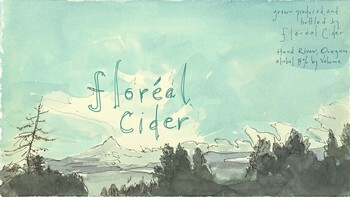 Click here to buy Floreal cider. Our cider can be tasted and purchased at Smockshop Band. We do not sell our cider at Mt. Hood Organic Farms.